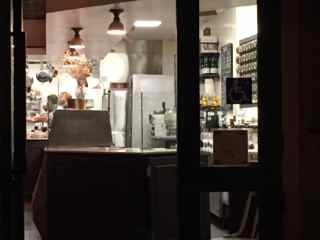 My sister told me about a pop-up restaurant in San Francisco--Sorrel. Chef Alex Hong, who went to the CIA at Hyde Park and trained at Quince and Jean Georges, offers a 4-course California cuisine with Italian influences. For now, dinner is served on Saturday nights at 7:30 pm at Picnic on 3rd--493 3rd Street. Buy a ticket online at EventBrite. We were there this last weekend and our ticket was $48--including tax and tip. Tickets have gone up in price for subsequent dinners--$55. You can get wine when you arrive and pay for it with a credit card. We chose the wine pairing for $32. Street parking is free after 6 pm north of Bryant. Park 1 block south and parking is enforced until 10 pm. They were a little late in opening the doors at 7:35 pm. I was surprised when we arrived at 7:25 that there were no other patrons there. After a few minutes, 6 more people showed up but by the time we were seated and settled, the restaurant, which seats 50, was full. Even though Picnic is a casual restaurant, the tables were covered with white tablecloths and the table was set with a white napkin, 1 fork and 1 knife. There was a votive candle and the water glass was a mason jar. The room had wood floors and a metal ceiling so sound projected and it was very loud. Probably not the place for a romantic dinner for 2. The clientele was mainly millenials. We were the oldest ones there and we're in our early 50s. It's an open-kitchen so you can watch the intimate details of your meal being prepared. 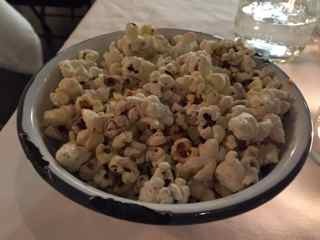 Popcorn with sea salt, pink peppercorn and lavender arrived at the table. 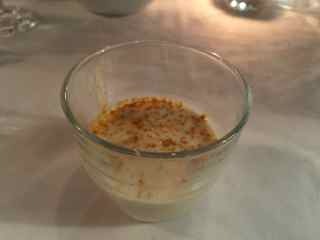 Amuse Bouche of Sunchoke Soup with Turmeric. This was creamy and delicious. It needed just a few more crystals of salt and it would have been perfect. 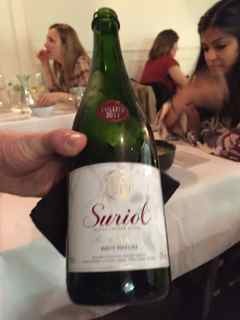 The sunchoke soup was paired with a cava--Suriol. This wasn't too yeasty but had a little bitterness for a finish. 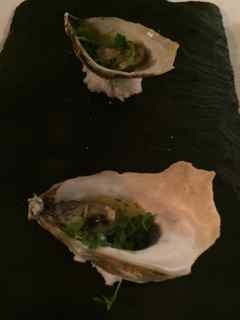 Another amuse--BBQ salt oysters from Washington with micro greens and cilantro, ginger and zested Buddha's hand. I loved the Buddha's hand. It gave the dish a nice little citrus note that was slightly different from your usual lemon, lime or orange. 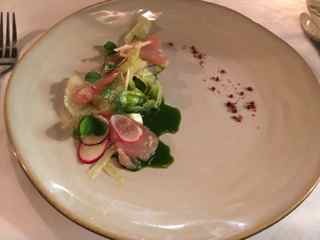 The first course was White Tuna Crudo, Dill Weed, Pink Peppercorn, Fennel Slaw, Sorrel Juice. The tuna was very fresh, the fennel slaw was delicious and I liked the slight sourness of the sorrel. My husband got a slice of watermelon turnip in his and all 3 of his tuna pieces were double the size of mine. Plating could be improved. The crudo was paired with Pierre Henri Gadais, Melon, Muscadet, France 2014. 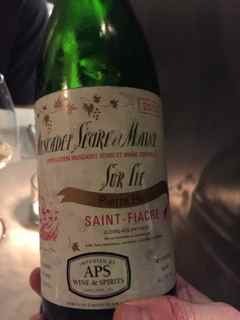 This muscadet paired so well with the tuna. This was the best pairing of the evening. The 2nd course was Beef Cheek Paccheri, Cavolo Nero, Black Olive, Calabrian Chili, Fontina Fonduta. The beef was fork tender but over-salted. 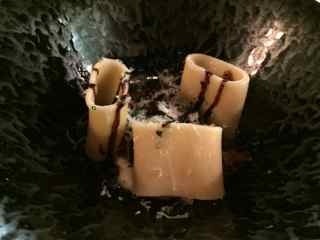 I loved the paccheri--perfectly cooked al dente. I wasn't sure the fontina fonduta added to to the dish but the olive drizzle was perfect. 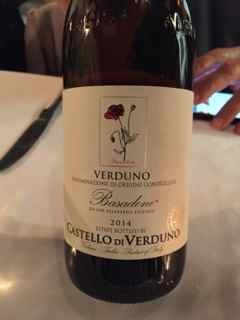 The 2nd course was paired with Castello di Verduno, Pelavarga, Piemonte, Italy 2014. This did not pair as well as our first wine. This did not have a good finish. 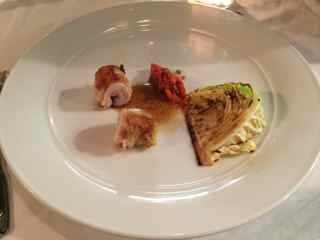 Our main course was Stuffed Devils Gulch Rabbit, Blistered Cabbage, Black Truffle Sauce. There was also a quenelle of roasted red peppers. This was a small portion for an entree. One more piece of rabbit and I would have been happy. The rabbit was incredibly moist and delicious. I didn't have any stuffing in mine but I could taste the goat cheese. I think it all melted on the pan. I liked the truffle sauce and the roasted red peppers. I would have preferred my cabbage cooked a little longer than blistered. 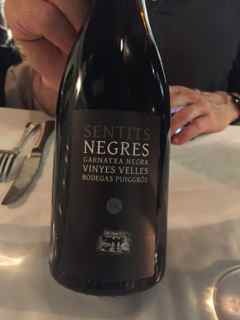 The rabbit was paired with Puiggros, Grenache, Catalunya, Spain 2011. I didn't like this pairing either. It didn't add much to the rabbit. 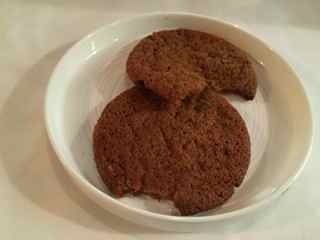 We got a plate of Ginger Molasses cookies. Our cookies had a couple chunks missing--I didn't see anyone take a bite out of it so I think my missing chunks are still on the baking sheet. The cookies had too much baking powder. 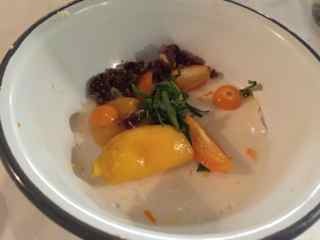 Dessert was Goat Cheese Panna Cotta, Toasted Oats, Mango, Basil. The panna cotta had too much gelatin and was firm instead of creamy. This was paired with Nonino, Amaro, Italy, which I didn't like either. It had a bitterness at the end. I think if the panna cotta was richer, this would have worked. Overall, I liked dinner and at $48, it was a good value. Chef Hong has potential but he still needs a little more experience. Also, if they plan to open a restaurant and get inspected, they have some sanitation issues to improve--you can see everything that happens in an open kitchen. For as long as I can remember, food has played a huge role in my life. I plan my dinner as I eat my lunch. I'm fortunate to live in the San Francisco Bay Area and am able to dine at world class restaurants as well as delicious hole-in-the-walls. I love to travel and plan my trips around the food. My sister calls me "Dory" because my memory is so poor. This blog is a way for me to remember and to share my tips..